Goodall Homes hosted a very creative and exciting Realtor Chili Lunch at our Ladd Park community today. During the event, Goodall representatives pretended to be working for "Goodall Community Hospital", dressed up in lab coats and scrubs, while handing out "prescriptions" for realtors to put in the First Aid Kits that were given to them upon their arrival. There were a total of 8 prescriptions, and each one highlighted a market home that is available between now and the end of the year in our Williamson County communities of Bent Creek (Nolensville), Ladd Park (Franklin), and Canterbury (Thompson's Station). These prescriptions were obtained by visiting homes throughout the community as they learned more about Goodall's available Market Homes and floorplans. After eating a filling lunch consisting of chili, chips and dip, and multiple delicious desserts, Realtors hopped aboard "ambulances" (aka, Goodall vans) and took off for various homes throughout Ladd Park. 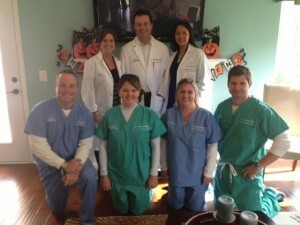 Once all 8 prescriptions were gathered, Realtors returned to the Model Home to redeem a $20 gift card to Target. Three lucky winners also received a $250 gift card for Southwest Airlines. The winners were Jack Allen (Exit Realty), Mike Nastri (Keller Williams), and Mark Pfiffner (Prudential Woodmont). All in all, we had the opportunity to visit with about 60+ realtors today, and are better because of it!